"Now you listen here—he's not the Messiah. He's a very naughty boy." Irreverence, thy name is Python. Long after their BBC series wound up, and five years after sticking it to Arthur and the Knights of the Round Table, the merry band who made up Monty Python's Flying Circus reconvened to have a go at the excesses and cultishness of much of organized religion. On some level, you might expect them to come in for more criticism than did Martin Scorsese for The Last Temptation of Christ, but the fellows are content to leave religious beliefs alone—we are each the keepers of our own very silly souls, and this movie is about lemmings and the crimes committed in the name of faith, not an assault on any particular group's set of beliefs. And it is, unsurprisingly, very, very funny. The conceit of the movie is that it tells the faux biography of the title character, born in the manger next to Christ's—the three wise men show up for the birth of Brian, but soon discover that they've got it wrong, and quickly shuffle over to the barn next door. Graham Chapman gives a wonderfully naïve performance as Brian, a bit of a dunderhead who just wants to go along, but finds himself, despite all of his best efforts, the focal point of a swelling cult. Many of the best jokes come from taking the New Testament at face value, or asking somewhat mundane questions about the divine—how, for instance, in an age millennia before amplification, could any but those in the very front catch the words of the Sermon on the Mount? Blessed are the cheese makers, indeed. One doesn't want to look too deeply into Python, for fear of becoming one of the very self-important folk that they so frequently lampoon, but looking at the film again in this Immaculate Edition does in fact bring a new sort of relevance for our own time, because Brian is recruited into a Middle Eastern subversive terrorist organization devoted to wreaking havoc on the Western imperialist occupiers—it's kind of a stretch to go from al-Qaeda to the People's Front of Judea, certainly, but it isn't that much of a struggle to connect the dots. The best comedy in this terrain comes from the petty, internecine warfare among the rebel groups—the People's Front of Judea has a sworn enemy: the Judean People's Front. And as in any satire worth its salt, there's nothing sacred here—coming in for the most abuse may be Pontius Pilate, who is a lisping, pauncy queen of a tyrant. Monty Python is the true heir to the traditions of vaudeville and the music hall—the seven members of the troupe play all the principal roles, and much of the fun is from seeing familiar faces turn up in seven, eight or ten different parts. The stag group loves to get all frilly as well, and are happy to go in drag to play the women's roles to boot. Given that Brian's life deliberately parallels that of Christ, it's no surprise that things end badly, and the film makes the best of that, trumping up some comedy out of that laff riot Roman tradition, the crucifixion. Holy Grail is probably the Python gold standard; this may not be quite as strong an effort, but it's always very smart and frequently and often stupidly amusing. Image Transfer Review: The film has been adequately transferred—Terry Gilliam's animated contributions look especially clean—but really, there are many reasons to be interested in watching this movie, but I cannot imagine that the picture quality of cinematography is one of them. Audio Transfer Review: Lots of atmospherics on the 5.1 track—it's almost a little too busy, and some of the dialogue can be a bit obscured. Extras Review: We get five Pythons on two commentary tracks, offering random recollections of the shoot—it's nice to hear from them, and perhaps schedules wouldn't allow, but it's an obvious disappointment that each of the five were recorded individually, their comments spliced together. Still, there's some interesting stuff here—it seems as if the Terry Gilliam/Terry Jones co-directing arrangement on Holy Grail wasn't a happy one, so Jones flies solo here, and there's no doubting that Gilliam's tolerance for all things Python was wearing thin. (It's only two years later that he directed Brazil.) The production also profitably followed in the footsteps of Franco Zeffirelli, using many of the same Tunisian locations, equipment and even extras as Jesus of Nazareth. The second disc in the set has some marvelous stuff as well, and top of the list is the audio recording (1:50m:41s) of a script readthrough from July 1977, accompanied by Jones' storyboards. You can hear the guys cutting up, working on the material, figuring out which jokes play and which need to be punched up, and which scenes are likely not to make it to the final cut—it's a great look at their working process. Similarly, a package (13m:16s) of five deleted scenes offers some jokey stuff (some fey shepherds, for instance), but you can see why each of these were cut; four of them come with commentary as well. The Story of Brian (59m:47s) is a thorough making-of piece, with vintage and new interviews, lots and lots of clips from the set, and candid, mostly happy reflections on the making of the picture. Four radio spots are quite amusing as well, featuring the likes of John Cleese's mother and Michael Palin's dentist encouraging us to see the movie. A photo gallery offers black-and-white snaps from the set; and you can click on a boom mike on the main menu to get a look at DVD credits. Also, Python must have some sort of huge Portuguese fan base, as not only the feature, but the extras package and both commentary tracks all come with Portuguese subtitles. 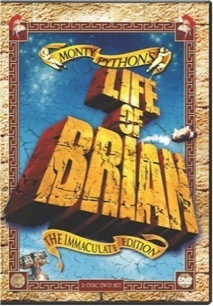 I know that Python fans can be annoying, and watch and rewatch their sacred texts with the reverence of the sort of cult that gets rightly mocked in a movie like this—so ignore the twits who simply holler the punchlines at one another, and the true believers truly have nothing to fear from Brian. A very funny movie with ample, informative and frequently hilarious extras.